The science fair…I still remember competing in one when I was just seven years old. 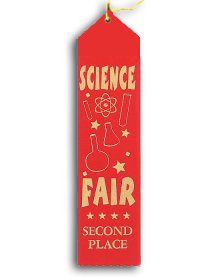 It stands out in my mind for several reasons- the hours spent learning about and making simple machines, having to explain my project to judges even though I was extremely shy, and the red second place ribbon I received, which still has a place in my childhood scrapbook. I am not sure how I got entered in the science fair, but I believe it was my mother’s idea. I knew absolutely nothing about simple machines. It was quite a foreign topic to a second grader. I remember pouring over many books at the kitchen table and trying to “craft” a pulley system. Flash forward decades and I am helping my own daughter with a project for her science fair. Like many participants we found ourselves waiting until the last minute to get our act together. Once we did, some extraordinary little things started to happen. By the end of the first evening of setting up the science project, older brothers were showing interest in what was going on. Some conversations between them and my husband were overheard about sound waves and matter. Various family members kept trying to play “tunes” on the glass bottle arrangement. Suddenly – there was a genuine interest in science right there in the living room. For more advice on getting children interested in science, I had the opportunity to talk with an expert, Nicole Kowrach from the Museum of Science and Industry. Kowrach is the Director of Teaching and Learning. One of her best tips for encouraging children to participate in a science fair is to choose a topic that interests them. "Rather than page through a book of science experiments to pick something, have your child spend a couple of days thinking! Think about what real-life questions they have." Relevancy to their lives is key. "They will be more motivated when the science fair topic derives from a question they have or something they have noticed, possibly in even in their own home. For example, when turning lights on and off at home, what would happen if we replaced all incandescent bulbs with CFL (compact fluorescent light) bulbs? Would that save money on the power bill? Or what is the difference in the toothpaste I use compared to my mom and dad’s adult toothpaste?" "Once your topic is chosen, include the scientific process and talk about dependent and independent variables. In the toothpaste experiment, your dependent variable could be the toothpaste or how clean the tooth got. The independent variable is something you change or alter- such as the type of toothpaste or the amount of time you left the toothpaste on the tooth." There is something to be said for competition, judges, and awards. "However, one advantage of a non-competitive science fair is that students might be more open to participate, especially if they feel that science is not their particular strength." Having helped coordinate my child's school science fair, I've observed how the social aspect of the event increased excitement for science as well. It is very rewarding to see a student's work displayed and listen to them explain with pride what they accomplished. MSI has undergone a major shift in the last seven years making science more social as well with the addition of increased human presence on the museum floor. Facilitators and staff engage guests with mini presentations or conduct experiments while promoting discussions and talking about science. My children experienced this while visiting the Body World exhibit a year or so ago. A museum employee had them all test their reaction times, by trying to grab a ruler. We talked about how the brain, eye, and hand all coordinated to make it happen. They also wanted to see who was the fastest. That quick “hands-on” experiment and short discussion made the science that more relatable. I confessed in some of my experiences with school children, I perceived a lack in anyone “wanting to be a scientist” when they grew up. Are there any science heroes for children to look up to? Part of the mission of MSI is to help children and adults see the world through the lens of science, engineering and design. Whether your child participates in a science fair or not, just making science part of your discussions at home can make a difference in sparking an interest. The Museum of Science and Industry has many resources for teachers, parents, and students on-line and in the museum to take advantage of. Summer Brain Games- Starting in June, for about 8-10 weeks- fun science ideas that appeal to a range of ages will be delivered to your inbox. Activities can be done with simple items from your kitchen or hardware store. New this year MSI is partnering with the Chicago Public Library. Chicago Public Library will go beyond summer reading by calling their program Summer Learning. This summers programming incorporates science books and hands-on STEM (Science, Technology, Engineering and Math) activities.